Saint Michael, MN – With radon being one of the leading causes of lung cancer today, it’s vital to bring attention to this often-overlooked danger. January is National Radon Month, making it a good time to purchase a home radon test kit or hire a professional radon mitigation contractor. Twin Cities Radon Services is an expert on radon mitigation and has made a number of recommendations for homeowners during National Radon Month. Radon is a naturally occurring gas that is released from soil. Because it is a radioactive carcinogen gas, it can be dangerous to people if it travels up into their homes. Radon is responsible for 20,000 lung cancer deaths each year, making it the second-leading cause of lung cancer (behind smoking). Luckily, there are ways to lessen the amount of radon in a home, thereby preventing the contraction of lung cancer. Radon mitigation is becoming a common service that a number of contractors can provide. Twin Cities Radon Services is encouraging homeowners to test their homes for radon this New Year. Because radon gas is colorless and odorless, it is not detected unless a specific test for the gas is performed. It’s important that each homeowner tests their home for radon before it’s too late. Radon in a building is measured by picocuries per liter (pCi/L). The Environmental Protection Agency (EPA) recommends mitigating any building with a radon measurement at or above 4.0 picocuries per liter. When a building’s radon levels are found to be unhealthy, a radon mitigation system is specially designed to effectively reduce the levels to a healthier amount. Radon abatement methods can keep radon from entering a house, including soil suction, which draw the radon from below the basement or crawl space floor and push it outside. Some other radon mitigation techniques include sealing, house/room pressurization, heat recovery ventilation, and natural ventilation. Twin Cities Radon Services is Minnesota’s expert basement waterproofing, crawl space, sump pump installation and foundation repair contractor. Their radon mitigation systems use sub-slab depressurization to reduce radon levels. A PVC pipe collects soil gasses, radon is piped upwards in the building, and then a radon depressurization vent forces radon out of the house. 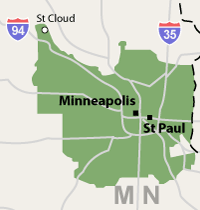 Twin Cities Radon Services serves Minnesota, including Minneapolis, St. Paul, Carver, Saint Paul, Newport, Scandia and surrounding areas. They have years of experience building and drying basements, and they are members of the Basement Systems international network of basement waterproofing specialists. For more information about this radon mitigation company in Minneapolis or a free estimate contact them today.